To get to the insides of a Juno-106 or HS-60 keyboard, you will need to remove four screws - two from each end cap, as indicated in the photo. These are Phillips-head machine screws, so you will need a medium Phillips screwdriver. Do not remove any of the other screws in the end caps. 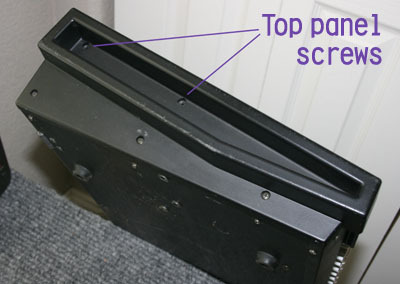 Once these four screws are removed, lift the front edge of the panel, and open it like a car hood (it is hinged along the back edge).